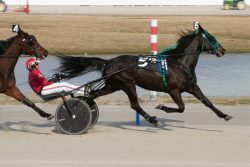 Lebanon, OH — All About Cowboys (Jason Brewer) dominated the $25,000 Open I Trot at Miami Valley Raceway on Sunday afternoon (March 17), establishing a new lifetime mark in the process. All About Cowboys captured the Open I Trot at Miami Valley on Sunday in a new lifetime best clocking of 1:53.3. Conrad photo. The 6-year-old Ken Rucker trainee grabbed the front end during a :27.1 first quarter, then proceeded to trip the subsequent timing beams in :56.1 and 1:25.2 before scooting home in :28.1 to record the 1:53.3 victory. The gelded son of Swan For All towed pocket sitter Primed N Powerful (Tyler Smith) through the finish line in second with Andy Ray (Elliott Deaton) rallying from fifth to third in the stretch. The triumph was the 16th in 91 career starts for All About Cowboys, who blew past the $200,000 earnings plateau with the win. Green Acres LLC and Mike Klimas of Illinois own the ultra-consistent winner who has banked $58,180 in eight 2019 starts at Miami Valley. A $20,000 Open II Trot was captured easily by Mugshot Man (Chris Page), who was open lengths better than Pass The Vape (Derek Watiker) and Impressive Chief (Brett Miller) in 1:54.4. It was just the second win in the last two seasons for the 6-year-old son of Jailhouse Jesse, but was the quickest of his 10 lifetime victories. Fred Morgan Jr. trains Mugshot Man for owner John Holman. The Red Owens Memorial late-closer for green fillies and mares got underway on Sunday as well. Heavily-favored Ben’s Jenna (Trace Tetrick) lived up to the public’s expectations, but only narrowly. The Mach Three-sired sophomore won for the third time in just six lifetime starts in 1:56.3. Delight Kate (Tyler Smith) and Respect (Kyle Ater) were next best in a tightly bunched field at the finish. Tyler George conditions the winner for David Kryway and the Ontario LTD stable.